After round 2 of the 2018 Touring car masters series at Symmons Plains in Tasmania, Ryan Hansford and his Multispares Torana is 2nd in class and 5th overall in the points. It was a case of the “good, bad and the ugly” in Tasmania with a weekend that showed a glimpse of Ryan’s brilliant driving in tricky conditions, Adelaide street circuit kerbs striking again and just plain bad luck when a brand new set of plug leads had a failure sitting on the grid for the final race. In qualifying on Friday John Bowe and Steve Johnson set the early pace with Ryan third sitting comfortably 3rd. Then Ryan put a string of 3 laps together that were really quick, one of which put him to the top of the times. As the minutes ticked by and all three sat in the pits conserving their tyres, it looked like he might have another pole position but with a few minutes remaining both Johnson and Bowe went out for one more flying lap. Not wanting to let them have it all their own way Ryan followed, and in true qualifying style, all three did great laps but in the end Bowe was too good grabbing Pole, then Johnson, and Ryan a terrific 3rd. After chasing between .6 & .9 of a second most of last year, Ryan was now within .4 of his more experienced rivals, and with a faster car being built, the team were upbeat. Race 1 of 4 over every TCM weekend is the trophy race where they reverse the grid, and give every competitor equal points to start and points to finish. Knowing Adelaide is tough on cars, and with Ryan making contact with a wall at the round 1 event, after it was repaired all the front suspension was inspected and the Torana was run at Queensland Raceway before leaving for Tasmania, but just as Ryan was making his way through the field, a lower ball joint sheared, leaving the Torana stranded on track and out of the race. As these parts normally last a couple of seasons it can only come down to the crash in Adelaide or just the sheer brutality of how the top drivers fly over those kerbs around the street circuit. Ryan finished the Saturday afternoon race 2 in 3rd behind Johnson and Bowe just lacking that little bit of pace, but come Sunday morning for race 3, the track was damp after early drizzle. Ryan started cautiously and dropped a couple of spots in the first half a lap, but soon found his rhythm getting back to 3rd and out after John Bowe. In one of his best drives so far in TCM, Ryan caught and passed JB, was catching Stevie J until the track dried and then held out Bowe to finish 2nd and really showed why his two senior competitors should be worried. With the Multispares Torana sitting 2nd for the final race of the weekend, Ryan was pumped to have a real go. 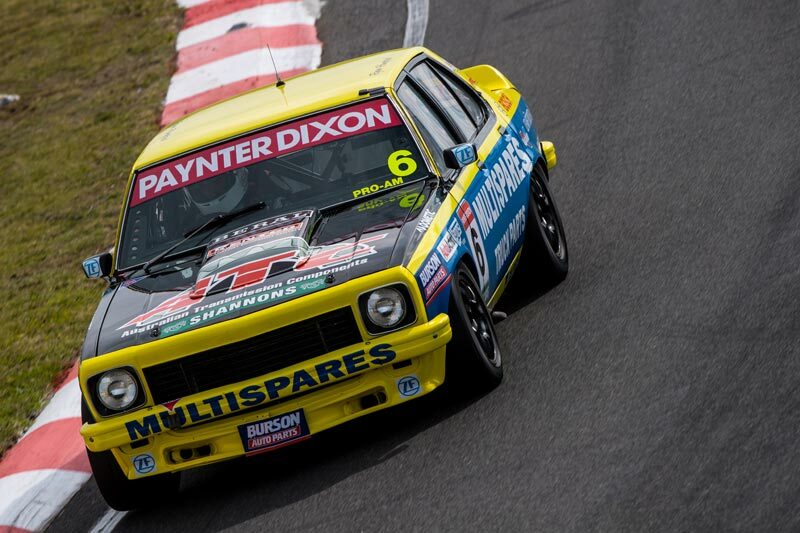 All these 600+ HP TCM race cars are hard on their tyres over the course of the weekend, and Ryan hoped that he had left his best till last and could have a crack at staying with Steve Johnson and grabbing another podium. The team had taken some advice to get a brand new set of “made to order” spark plug leads for the 5 Litre Chevy engine and as Ryan was on his warm up lap the Torana suddenly went onto 7 cylinders with Ryan having to pit only to find that the no.3 plug lead had failed. As always, Ryan copped it on the chin and enjoyed a terrific afternoon, mingling with the Multispares guests that came out to spend a day at the track with the team. Remaining Touring car Masters Series, all televised live on Foxsports.